The LIDF starts more or less now, with the premiere of Abel Feraras innovative docu-film Napoli, Napoli, Napoli at the Barbican this evening (I’m sorry I’ll miss that and the party afterwards) and it goes on until 8 May featuring more than 130 films from 36 countries, bringing the worlds stories to the capital. One of the reasons I’ve not been posting much this week is that I’ve been busy putting together a small presentation for The Invisible City tomorrow. The event starts at 10.30 am and goes on until 4.30pm, though my contribution is mercifully shorter. I’m actually taking two pieces to the event. One is a rather higher resolution printed version of a kind of psycho-geographic spoof I wrote for a web site that folded soon afterwards (I think co-incidentally.) I’m told that Hub Kings Cross where the event is being held would like to keep it up on the wall for a while after Saturday, but I don’t know any details. I’m please to be going back to King’s Cross too, as its an area I was involved a little with around the start of the Kings Cross Railway Lands Group, helping in a very small way in the planning exercises they organised to find what residents of the area really wanted. Apart from a few minor corrections, slightly better image quality and a slightly different layout with each page on the web site being replaced by an A4 sheet, ‘1989‘ remains more or less as it is on the web. There are some small compromises in design, partly because I had to do it a a hurry, but also because although the images are large enough, I think ideally I would have liked them just a little bigger and with more white space. What I’m putting on display is more like a print or magazine version of the work (I put it together and printed it using Desk Top Publishing software.) Years ago I used to occasionally teach a little using Pagemaker and it still does a neat job without fuss. Printing was very easy after a first ruined sheet when I forgot what I was doing. Using the Epson ABW method they provide on the R2400 (and other printers) it was simply a matter of choosing my own preferences for the colour of the black and white images and reducing the ink by around 10% which I find gives better prints on the Epson Archival Matte paper. It is normally only a material I use for proof prints, as it can give a rather nasty yellowing with age, but so long as these prints last on a wall for a few weeks they will have done their job. The other thing I’ve been working on for LIDF is a 20 minute presentation on 30 years of my work in the Lea Valley. The finished presentation includes work from 1982 to 2010 and concentrates on the Olympic area and south from there, although there are some pictures from further north – including the source. Many of the pictures I’ll be showing are on my River Lea – Lea Valley web site, but there are quite a few that have yet to make their way there, including some I’d forgotten about myself. If I’d had another month to prepare I would have included more of my colour work, including more panoramics as there are still some parts of my archive which are pretty unexplored. 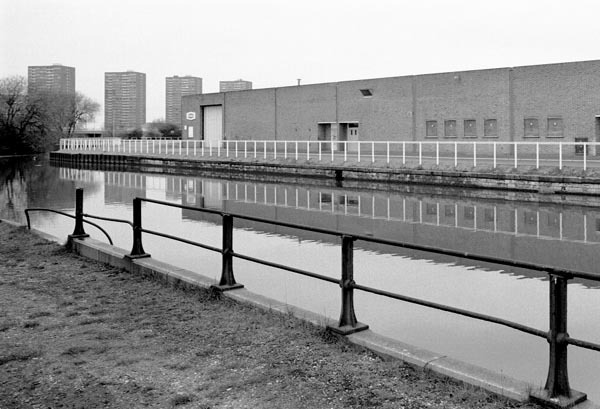 Behind these warehouses on the Lea Navigation, in Duck Lees Lane, Ponders End was the works where one of the key inventions of the 20th century was made, the foundation of the whole electronics industry. But I may well forget to mention that tomorrow! Putting the presentation together has been a major effort, first of all finding and scanning images and then hours of swearing at Microsoft Power Point. In the end I ended up finishing it in Open Office’s equivalent, Impress, where I found ways to do things rather faster. It also enabled me to export a high resolution version as a PDF which might be useful. 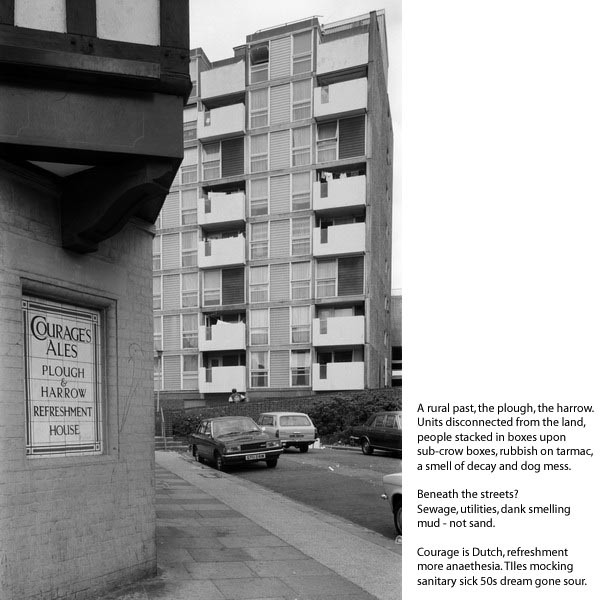 Other photographers taking part include Tom Hunter with his Swan Songs and Life and Death in Hackney; Ruth Baily with pictures of the Midland Hotel and Alexander Brattell’s exploration of Victoria Park. Mike Seaborne, who runs the Urban Landscape web site with me is also talking there. This entry was posted on Friday, April 23rd, 2010 at 05:24 pm and is filed under My Own Work, Photographers. You can follow any responses to this entry through the RSS 2.0 feed. You can leave a response, or trackback from your own site.